Opening Reception: March 7, 5:30 to 8:30 We have an exciting show planned for March. Frank Spino is our award winning artist with his solo show entitled, "Good Enough to Eat" Frank says, 'Color excites me. Realism and rich, saturated color are what my art is all about. 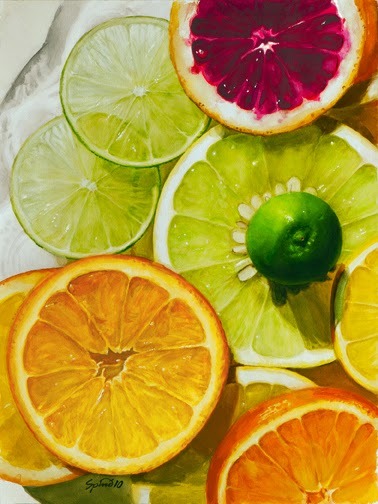 This show focuses on my fascination with painting citrus. I love the vibrant color and challenging textures: thick, dimpled rinds; thin, transparent slices, freshly cut and glistening wet with juice.' He hopes you'll find that my paintings look ­– “Good Enough to Eat” . Gallery telephone number is 321 259-8261. Visit us nline: www.fifthavenueartgallery.com and on Facebook.